Thorns of the Carrion was one of the plenty of barely known death/doom bands, which were not able to spark wider attention (in this style it couldn't be a reasonable goal anyway), but they belong to the most genuine bands of the genre. 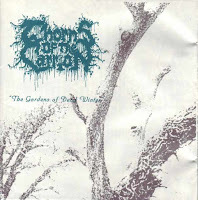 "The Gardens of Dead Winter" is like a miserable struggle that could be ideal to portay depressive inner strugges. It's the musical struggle of the dark harmony of classical heavy, noisy death/doom with deep growling vocals, that lacks all aesthetic features; and the brighter, atmospheric harmony based on melancholy. But even this atmosphere (created mostly by keyboards and violin) is also not unified, and instead of compensing the cold and distressing main feeling, it's just turning it more disturbed. And there is the struggle of harmony and disharmony too, that could be the third corner of this imaginary triangle of desperate melancholy. The strong atmosphere and the lyrical topics gave a gothic touch to their music, but still the heaviness is predominating, and the album isn't enough melodic to catch emotional heights. So it's rather a classic of ordinary death/doom, than the more popular romance-based direction.